Robert McMahon is Head of Politics at Radley College, Abingdon and a member of the Department of Politics at the University of Oxford. He holds an MA and M.Phil. from New College, Oxford and a D.Phil. from Nuffield College, Oxford. Rob worked as a Policy Analyst at HM Treasury from 1999 to 2001 dealing with transport spending and then poverty analysis. He now teaches courses on US and UK government, political sociology and comparative government. Essential reading to all those concerned with environmental regulation and those charged with creating – and reforming – public-sector bureaucracies. Covers issues of organizational design, comparative public policy, and management and organizational studies. 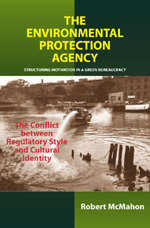 By utilizing the lenses of institutions and culture – examining the relationship between regulator and regulated, dominant regulatory style, and interaction with the institutions of government – this book challenges the contemporary wisdom that recommends holistic and integrated institutional forms that result in the decimation of existing cultural identifications. No sense of bureaucratic mission can be established where cultural identifications have been destroyed, regardless of the ingenuity of the institutional form adopted. The absence of such bureaucratic mission results in green bureaucracies that are likely to fail in the pursuit of organizational goals. Examining motivations shows why cultural identifications within an organization must be congruent with institutional structures so that these identifications can be established. The Environmental Protection Agency is an important book. Drawing on a wealth of original research including primary sources and extensive interviews, Robert McMahon provides the first comprehensive comparative study of the American and British environmental protection agencies with accounts of how they were established, their distinctive institutional and organizational features and their effectiveness. However, McMahon does more than simply analytically narrate these agencies’ origins and work: he develops and persuasively defends a distinct theoretical analysis about these green bureaucracies as types of organizations shaped by their institutional design and internal cultural norms. The result is an original and impressive book which will be of interest of scholars and students of bureaucracy, the environment, and British and American politics. I recommend The Environmental Protection Agency highly.